Big John and Ray admire the police and how they go above and beyond to help citizens. Ashley Tomasewski joins John and Ray to talk about Officer Chris Kudla who is battling Stage 4 kidney cancer. She talks about how you can help by donating to his GoFundMe page, but also how you can attend the Culvers Family night happening tonight. At this event, you can bring children to get their faces painted, take photos with superheroes, and get animal balloons. Not only that but at the register when you said ‘I’m here to support Chris” 10% of your purchase will go to his medical fund. This all happening at Culvers in Lyons Illinois, tonight from 5 – 8 pm. Every year as a new baseball season begins, fans are not just greeted with the promise of a rejuvenated ball club, but with the offer of new and exciting ballpark experiences. Guaranteed Rate Field has been well known for offering an eclectic and delicious menagerie of food not only on their ballpark concourse, but also in other areas of the ballpark including their Diamond Suites, Guaranteed Rate Club, and Huntington Bank Stadium club. This year, the White Sox culinary team has rolled out a variety of mouthwatering new options including hand-scooped ice cream served in homemade waffle cones, a variety of new Johnsonville specialty sausages with unique pitch-inspired names, the Cutter, the Slurve and the Cutter, a unique and healthier option — The Pozole Salad — along with more of your favorite hearty options including Provolone-stuffed dough balls, Buffalo Chicken Empanadas and more. The most unique addition to the concourse menu though has to be the Cuban Burger. The Cuban Burger pays homage to the Guaranteed Rate Field classic Cuban sandwich that has held popular residence at the ballpark since 2014, but does so with an American twist. Served on a traditional hamburger bun, the Cuban Burger is a juicy all-beef Glenmark patty topped with flavorful pulled pork carnitas, sliced ham, Swiss Cheese, mojo sauce, yellow mustard and finished off with a pickle. This sandwich is certainly a must-try at the ballpark in 2018. The White Sox will bringing the popular Craft Kave, the ballparks curation of local and craft beers, to a newly renovated space near Section 542. Among the new selection of beers are Allagash White, Left Hand Nitro Milk Stout, various brews from Pipeworks Brewing, Brickstone McCormick Place ale, and others. As mandated by Major League Baseball on February 1, all 30 MLB ballparks were to expand their protective netting past the dugouts for the safety of all ballpark patrons. 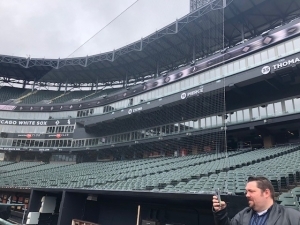 On Tuesday, the White Sox gave an up close look at the newly expanded netting that has been installed. In addition to the netting, other on-field upgrades include newly relocated retired number displays. Previously players retired numbers were displayed above home plate. However, the White Sox have expanded the LED ribbon to extend around the entire facade, and have relocated the numbers along the sides of right and left field. The new display is a simple and very tasteful way to bring fans attention to these players and their lasting legacies, which were previously in a small, concentrated space. The funnest addition to the ballpark campus in the coming season certainly has to be the new Virtual Reality Batting Cage that is located across the street from the ballpark on the first level of the Chicago Sports Depot. Tucked away in the back corner with a view of the street, the batting cage offers fans the opportunity to test out the VR technology that has previously only been available to access at the All-Star Game and other MLB fan events. Guaranteed Rate Field is one of the first major league parks to offer this experience. Stepping into the batting cage, fans will place the VR headset on and be given 90 seconds to swing for the fences all while experiencing the reality of beautiful Guaranteed Rate Field, complete with fan cheering. The VR experience will be open on game days from the time gates open until the final out of the game. With that being said, it certainly hasn’t been a Spring Training for the faint of heart. Multiple injuries have mounted on the field, Miguel Gonzalez struggled in his first outing back in a White Sox uniform, and folks caught a glimpse of the less refined version of their future superstar pitcher Michael Kopech. From Jake Burger to Nicky Delmonico, let’s take a look at the biggest takeaways from camp so far. The future is bright for young White Sox starter Lucas Giolito, who showed flashes of brilliance in his short debut with the big league club at the end of 2017. But in training camp, Giolito seems to be picking up where he left off. Giolito has started two games and pitched a total of six innings, while accumulating nine strikeouts, and eight of those nine punchouts came on Saturday afternoon against the Chicago Cubs. Giolito walked two on the afternoon and pitched four solid innings. “I was just trying to mix my it up a lot,” Giolito told the media after his outing on Saturday. “I was throwing the slider pretty much for strikes and was throwing the curveball a bit sharper, which is what I have been working on. With two strikes, I was able to get guys out with it. Overall my breaking stuff was working pretty well.” Giolito allowed just one earned run on Saturday, a homer off Cubs backup catcher Victor Caratini. As if the White Sox stockpile of injuries could mount any higher — two most players were added to the heap on Sunday. Outfielder Nicky Delmonico and shortstop Tyler Saladino collided trying to catch a pop-up in the seventh inning, and the collision prompted manager Rick Renteria to remove Saladino from the game and place him on the 7-day concussion list, while Delmonico has suffered a separated shoulder. “Just extended it,” Renteria said of the Delmonico injury. “Didn’t pop it. Didn’t do anything. Just got extended and jammed it a little bit.” With just two weeks until Opening Day, it is possible that for precautionary reasons, Delmonico will open the season on the disabled list. Delmonico was slated to be the White Sox starting left fielder, which now leaves the club ready to test the waters with Ryan Cordell, Leury Garcia and other options to fill that role. Not all of camp has been exceptionally gloomy in the way of injuries for the White Sox this spring. After being sidelined for two weeks with left knee tendinitis, the infamous Eloy Jimenez played his first full game of the spring on Sunday against the Diamondbacks. Jimenez first stepped up to the plate as a pinch-hitter in Saturday’s game, only to hit a go-ahead home run that tied the game 4-4. Sunday, Jimenez continued his success, hitting another home run in his first at-bat off Diamondbacks starter Patrick Corbin. Jimenez went on to hit a triple on a line drive to centerfield and walked in his final plate appearance of the day. Despite the success, Jimenez has only played a handful of games above Class A and will begin the season in Double A Birmingham, even if the stay there is short before he ventures up to Charlotte. The show will go on for Jimenez, just not with the big league club for right now. While fans prepare for warmer weather and Opening Day festivities, ball players have begun to welcome a new season by get back into the groove of everyday play. But not everyone is hearing the crack of bats at Spring Training camps just yet. From Jake Arrieta to Lucas Duda, there are still a handful of free agents left to be signed before Opening Day, and while the White Sox may not be looking to add a big name or contract to the fold just yet, there have been some interesting rumblings as we head into the first live action games of the year. MLB.com’s Jon Morosi reported earlier this week that an MLB executive noted third baseman Mike Moustakas may still have a good chance of landing with the White Sox. In a vacuum, a reunion with the Royals would seem to be the most likely outcome for Moustakas. But the Royals have commited to starting fresh with a young core after winning their first World Series title in 30 years with Moustakas, Hosmer, Cain, etc — all of which have not be resigned yet or have moved on. Moustakas had a strong season in 2017, hitting a career high 38 home runs in Kauffman Stadium. Moustakas also batted .272/.314/.521 while sporting a 114 wRC+. Not bad for a third baseman who is about to enter his age 30 season. The question now is simple. Are the White Sox uncomfortable enough with running out Matt Davidson and Co. everyday that they feel the need to sign a player such as Moustakas? After all, White Sox GM Rick Hahn was calculated enough to make it clear to folks pestering him with Manny Machado questions all winter that they were going to do what was best for their long term plan. Would that be to sign Moustakas to a one-year deal, and go after Machado in free agency next offseason? Considering Moustakas made just $8.7 million with the Royals in 2017 and is likely sitting at home waiting for his phone to ring, he could come at a bargain for the White Sox to add last minute, one that wouldn’t really jeopardize their financial plan for the future, but make the 2018 team considerably more solid on all fronts. Signing Moustakas for a year and even potentially flipping him at the trade deadline to finish out the season with Davidson or perhaps even a call up for Jake Burger could also be a route the White Sox are looking to take. They would be able to upgrade at third base for a while and cash in on prospects, should Moustakas have as successful of a season has he did with the Royals in 2017. Going into the season, the dust seems to have settled on which players will be starting at each position, and though it won’t be a brilliant crop on all accounts, it’s passable for a likely non-contending season that’s fresh on the heels of a rebuild. But when it comes to third base, it’s been a bit hazy for several seasons now. Davidson is obviously the leading candidate for the starting role, but considering he hit just .220/.260/.452 last season, the idea of him taking of the bulk of the playing time isn’t exactly ideal — even in this landscape. Davidson feels more suited to a bench role, where he can hone his best tool — his power — when the situational need arises. But there is no real reason to be running out a player who owned a very characteristic 37 percent strikeout rate in 443 plate appearances last season. Perhaps a possible last minute upgrade to the hot corner has been Hahn’s creative thinking at work all along, or perhaps this is simply a case of “Hey, we need a third baseman and you haven’t been signed yet”. Whether there will be any truth behind the speculation that Moustakas could land with the White Sox remains to be seen for now, but the main takeaway is that should a transaction come together in the next few weeks, it wouldn’t jeopardize the White Sox’s long term plans to be more active on the free agent market next offseason, but would lock in a solid starting third baseman for the coming season. Last day in Mexico!!! Steve is joined by Adam Engel of the White Sox and also grandson Jackson! Steve, Brendan, and Dag are in beautiful Riviera Maya, Mexico for the week! As they broadcast their WLS AM 890 radio show each day, we’re bringing the show directly to you! Tune in!